We had left overs for dinner last night and everyone got something different. 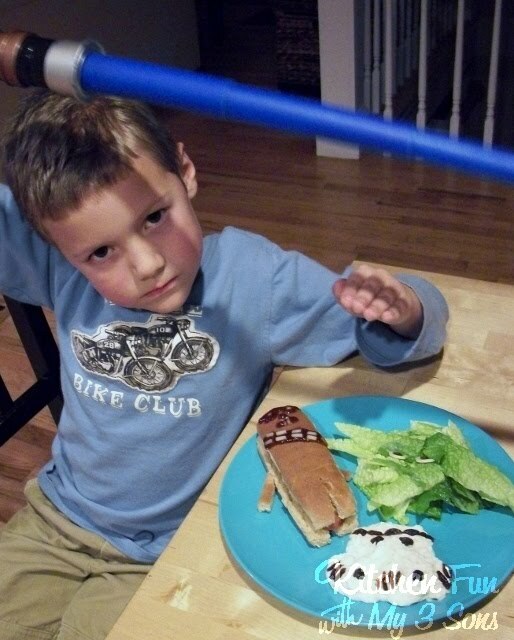 My 5 year old wanted a left over hot dog and asked if I could make him a Star Wars dinner. I said sure..why not! We decided to make Chewbacca, Yoda, and a Storm Trooper. This is what we came up with and it turned out pretty cute! He thought it was awesome!! To make the Chewy Dogs we used a hot dog bun, a turkey hot dog, white cheese, and barbecue sauce (you could use ketchup). Just make the hot dog, put it in the bun then flip it to the side. Cut out the bottom middle to make legs and use the scraps to make the arms. We squirted on just a little bit of sauce to make the face and band. We cut a couple of strips from a cheese slice to design the band and the teeth for his mouth. To make this Yodalicious Salad you will need lettuce, white cheese (or ranch dressing), and 1 raisin. Just shape the torn lettuce in the shape of Yoda’s head. Cut 2 small pieces of the white cheese to make the eyes. Cut a raisin in half and press on the cheese for the pupil. We cut out another small piece of lettuce to make eye lids, a nose, and a mouth. 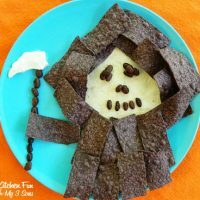 A fun way to get kids to eat some salad! Yoda says…mmmm, yummy salad this is indeed! We made the Storm Taters by shaping our mashed potatoes in the shape of a Storm Troopers head. We used raisins for details. You could also use black olives. This is a such a fun and very easy dinner to make for your little Star Wars fan. My boys love to turn anything in Star Wars..they are total Star Wars fanatics! That is hilarious. I love it! I'm all over the Yoda Salad. Great job! My boys would love this! Good grief! Its all I can do to get a dinner cooked even without making it a fantastic creation. That is the coolest thing ever! You win "Mom of the Year"! Do your kiddos know how blessed they are??? Aww…thanks Laura! We have lots of fun in our kitchen and my boys are very appreciative! My son would love this lunch! He is so into Star Wars! Love it! I found you via TGIF Linky Party and am a new follower. I have a new meme called Thematic Thursday and this week's theme is Winter/Snow. I'd love to see this post linked up. Find Thematic Thursday here. You should also check out my Bento Blog Network blog! You've got some cute things to link up! Love, love, love this idea!! My son is all about Star Wars. Just might have to try this. 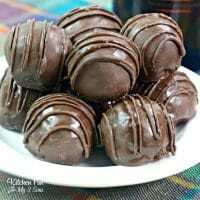 Stopping by from TGIF Linky Party. 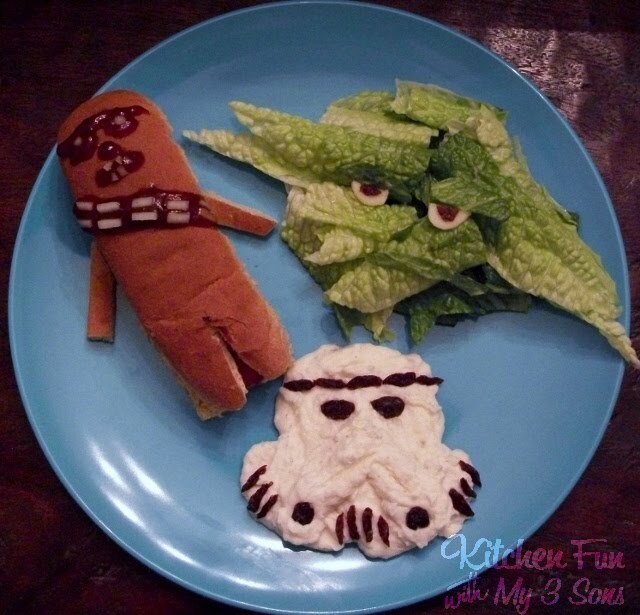 How fun, what a great Star Wars Meal, my kids would have loved this when they were younger, I bet they would still like it! How cool! That's awesome!!! My kids would love this … in a couple years :p can you do Cars or Thomas? lol Thanks for sharing! 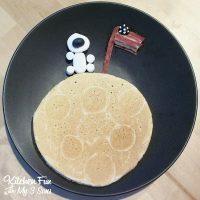 My little Star Wars nut would love this……..I'd love for you to share this at my "link & Greet" party over @CountryMommaCooks…Have a great weekend! I'm pretty sure my husband would LOVE this. Thanks! The Force is strong with you Jill! This is great– I'll be sure to share this with my friends that have children! Oh my gosh! This is awesome! I'm definitely doing this for my kids! I found you through Serenity You. Thanks for sharing! I love it! Such a super mom you are! Featuring at Bacon Time this Thursday. Please stop by to enter our Valentine contest too. Thanks everyone and thanks Mindie and Troublet for sharing!! I bet your son loves this! When my son gets older I'm sure he'll also want something like this! So inspired! I thought you should know, this girl is trying your claim your food art as her own. How do you create such amazing stuff. Do you sit down and sketch out your fun food idea, or do you just wing it? Sharing on Facebook. Thanks for linking up your mommy solution! Thanks! Crystal…we mostly just wing it. Everything just turns out better that way. If I have planned something in the past we end up changing it up as we go along anyways. Wow! You are amazing! So trying this!